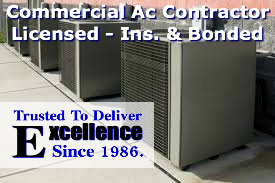 Air Conditioning Excellence, Inc. is committed to providing and installing the very best quality commercial air conditioning systems available today with low running costs, high efficiency and reduced maintenance requirements. Our Commercial AC Installation Fort Lauderdale is unbeatable! We're committed to complying with all relevant industry air conditioning installation standards and fulfilling current construction regulations to ensure that your air conditioning system is the right one, and is installed properly. Air Conditioning Excellence, Inc. works for a wide range of business customers who keep coming back to us because of our competitive pricing and efficient and friendly service. These businesses have included: shops, offices, schools, colleges, small workshops, estate agents, home offices and server rooms; all which are now benefiting from our commercial air conditioning systems. Our Commercial AC Installation Fort Lauderdale team always takes great pride in their work, constantly striving to offer the best service possible; not only installing fabulous commercial air conditioning systems for you, but looking after you and your premises from start to finish. Effectively designed and tailored commercial air conditioning is guaranteed to cut down on your energy bills, keep your staff more productive and make your business more energy efficient. Our air conditioning installations experience ensures the most comfortable and productive working environment for your staff and the most effective way of heating and cooling the room and the opportunity to put the money saved on your energy bills towards other aspects of your business. Working throughout South Florida installing the very best commercial equipment from all the major brands including Lennox, Trane, York, Carrier, Rheem, Bryant, American Standard, Amana, Westinghouse, Ruud, Day and Night. Our Commercial AC Installation Fort Lauderdale will actually reduce your business’s energy bills. Our team will ensure that your new cooling unit will be placed in the optimum place for effective and accurate usage, meaning less reliance on continual use and more effective climate control throughout your office, shop, classroom or other commercial property. With a wide range of commercial air conditioning units and models to choose from, we know how difficult it is to find the right system for your needs. We provide honest and impartial advice to ensure that you receive an air conditioning system that works best for your property. Computer dispatched throughout South Florida, our staff provides the most stylish, well placed and cost effective commercial air conditioning. We have recently undertaken projects for clients in Weston, Miramar, Hollywood, Fort Lauderdale, Pembroke Pines, Downtown Fort Lauderdale, Las Olas Fort Lauderdale, Deerfield Beach, Boynton Beach and many other locations in Broward, Palm Beach and North Dade County. Our commercial air conditioning installation can also enhance the efficiency and comfort of your system, by including assessment of indoor air quality and installation of building automation. An important part of our Commercial AC Installation Fort Lauderdale and repair service includes preventative maintenance contracts to ensure that your equipment remains functional and in good repair all year round. If you would like any more information about our Commercial AC Installation Fort Lauderdale, please do not hesitate to contact us.